Revised life reconstruction using the new body outline laser-stimulated fluorescence data. Credit: Julius T. Csotonyi. 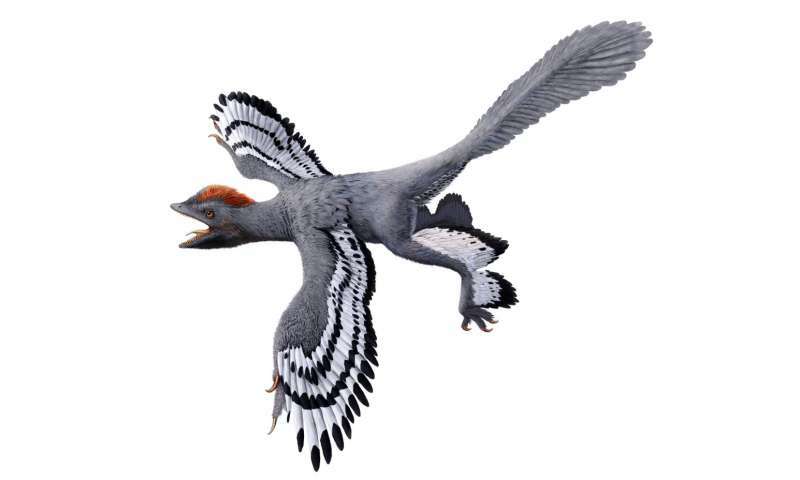 A chicken-sized, feathered dinosaur that scuttled around Earth 160 million years ago is helping flesh out the missing link between land-bound animals and flying ones, scientists said Tuesday. 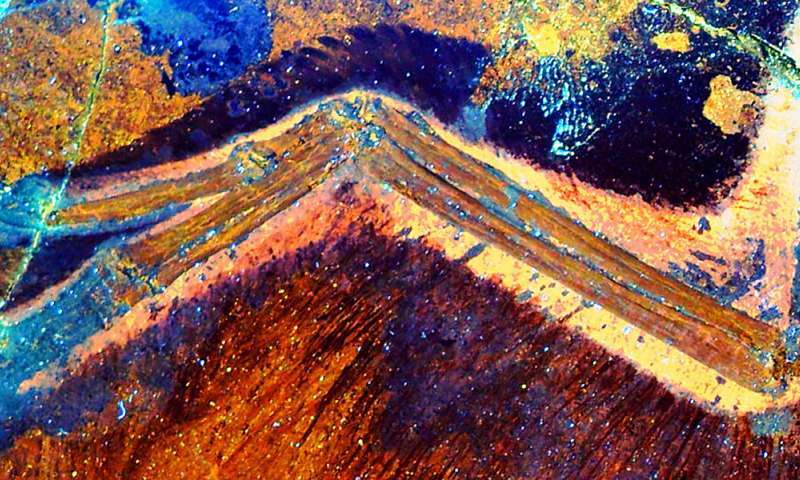 A team from China and the United States used lasers to study traces of soft tissue once attached to the now-fossilised bones of a Jurassic dinosaur called Anchiornis. The outlines revealed it had "drumstick-shaped legs, a slender tail and an arm that looks just like a modern bird wing," said Michael Pittman of the University of Hong Kong, who co-authored the study in Nature Communications. "We even have foot scales preserved in the Anchiornis specimens that are just like chickens today," he said in a video explaining the findings. It is still not clear if Anchiornis was a flier. Most of what scientists know about dinosaur body shape is gleaned from looking at fossilised skeletons and comparing them to living dinosaur relatives—birds and crocodiles. Pittman and a team used potent lasers to study the fossil-containing rock and isolate the imprint of the fleshy parts. "We shone violet lasers at Anchiornis specimens in a dark room to cause them to glow in the dark, revealing amazing details," said Pittman. 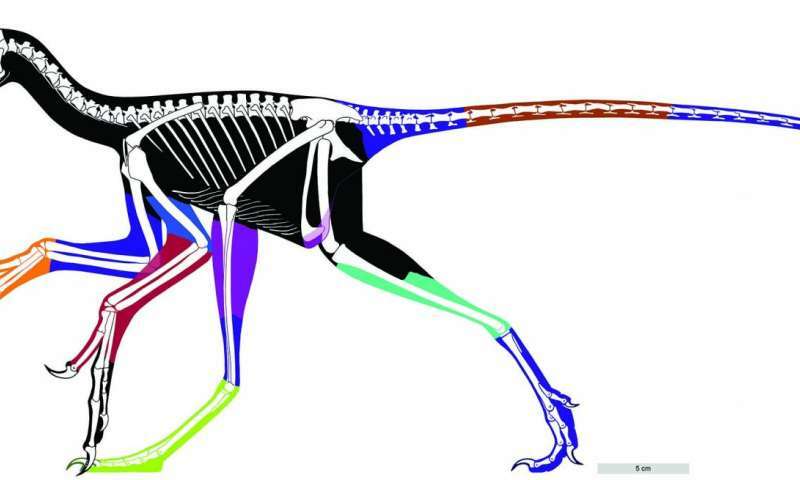 "This revealed the first quantitative high-detail outline of a feathered dinosaur." Scientists believe the study of Anchiornis is key to understanding the origin of birds, and of flight. The creature is thought to have lived at about the same time that birds first appeared on Earth. The lasers revealed a flap at the front of the creature's elbow, the team said. In modern birds, this is called the propatagium—the boneless leading edge of the wing, covered in feathers, and crucial for flight. Coloured areas represent different fossil specimens and black areas are approximated reconstructions. For the first time we have an accurate body outline of a bird-like dinosaur. Credit: Wang XL, Pittman M et al. 2017. "The fact that we find this really neat wing in an older bird-like animal is really exciting," said Pittman. It is hoped the new data will help unravel how, and when, birds evolved from Earth-bound into sky-soaring creatures. In 2010, a study of Anchiornis' feathers revealed it had sported a grey body, a reddish-brown Mohawk crest and facial speckles. The folds of skin in front of the elbow and behind the wrist (called patagia) were covered in feathers, just like in modern living birds. Credit: Wang XL, Pittman M et al. 2017.